Today, 21,098 students from 194 vocational schools (SMK) in East Jakarta take computer-based national exam (UNBK). East Jakarta Education Sub-dept. has prepared various supporting facilities for this exam.
" We have coordinated with PT. Telkom and PT. PLN to ensure internet network and electricity to run well"
East Jakarta Education Sub-dept. 's Region 2 Head, Abdul Rachem said, there are six public SMKs and 82 private SMKs in the area. But one of private SMK can't run UNBK, thus its students join other schools for UNBK exam. "There are 8,687 UNBK participants in Region 2. It consists of 1,490 public school students and 7,197 private school students," he informed in SMKN 22, Monday (4/2). According to him, UNBK is held for four days, from today to Thursday (4/5). Today's exam is Bahasa. While tomorrow will be English, then vocational theory exam on Thursday. Meanwhile, East Jakarta Education Sub-dept. 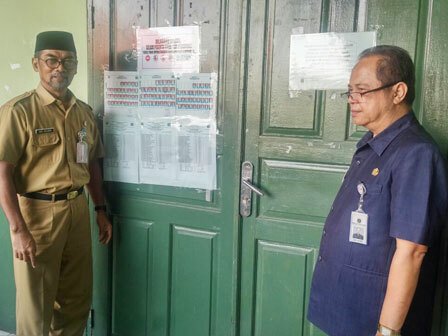 's Region 1 Head, Muhammad Roji also informed, there are 106 SMK which consists of 7 public SMK and 99 private SMK in his area with total 12,411 students; 1,754 students from public SMK and 10,657 students from private SMK. "We have coordinated with PT. Telkom and PT. PLN to ensure internet network and electricity to run well. But if there is a problem, re-exam can be done on the same day," he conveyed. There are 21,098 students who take UNBK from 3,244 public SMKs and 17,854 private SMKs in East Jakarta. SMK that conduct UNBK is encouraged to prepare generator set to anticipate power outages.